Home » Accounts » Bangalore » CENTRAL GOVERNMENT JOB » Karnataka » Managers » Manager and Accounts Jobs in KIOCL Limited at Bangaluru - 2018. 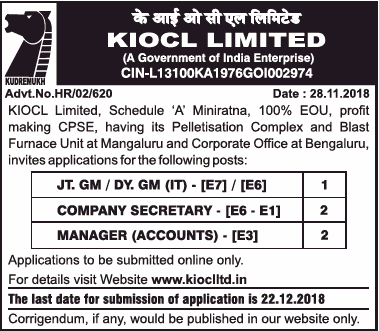 Manager and Accounts Jobs in KIOCL Limited at Bangaluru - 2018. Managaluru and Corporation Office at Bangaluru.